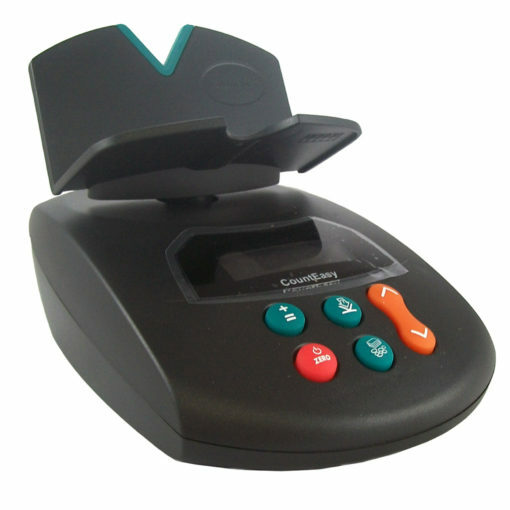 Count up the contents of a cash till in under a minute with the CountEasy cash scales. Preprogrammed to count your coins and notes sequentially, a calculator or pen and paper are no longer needed to total a cash till’s contents – the Counteasy displays a running total on its screen. These scales are light-weight, compact and ergonomically designed. The CountEasy can run on mains or on its 12-hour rechargable battery, so it is extremely portable. The Counteasy is configured to quickly and efficiently count the new 20, 10 and 5 euro notes. These intelligent counting scales have been proven to reduce end-of day till balancing from around 8 minutes to 45 seconds. Compact, robust and simple to operate, the CountEasy comes with a five-year “box swap” warranty for your peace of mind. Also included is the SK-415HB Deluxe Cash Drawer from Maken. The SK-415HB is a large capacity drawer made of steel. It features telescopic guides on its drawer and a metal removable coin/cash insert with a locking lid. The insert can be configured and adjusted in several different ways and has enough space for 8 sets of notes and 8 sets of coins. This attractive and affordable deluxe cash drawer is the perfect addition to any business. These removable cups coupled with the Omal Counteasy make for quick and efficient coin counting, allowing users to accurately count each coin denomination in an efficient 0.5 seconds, largely increasing user speed and productivity.